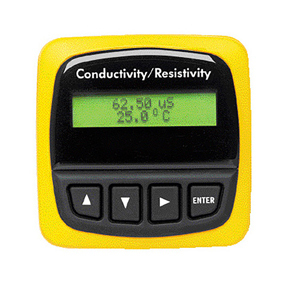 The CDTX-90 Series Conductivity/ Resistivity Transmitter is designed for broad application and ease of setup and use. The unit can be used for conductance, resistance, or TDS signal transmission and display. Mounting can be accomplished in several options best tailored to your application requirements. Full microprocessor based electronics allow wide operating range, and long term signal stability due to the elimination or potentiometers, jumpers and dip switches. Open Collector Output: Hi, Lo, Pulse, Off Open collector, optically isolated, 50 mA max, sink, 30 Vdc max. pull-up voltage. Max 400 pulses/min. Please download the full specifications below under "Related Links". 참고: CDTX-90-X comes complete with operator's manual. CDTX-90-XP comes complete with operator's manual, mounting bracket, and panel gasket. * Field Mount Transmitters Require FP90UM Universal Mounting Kit. The Universal Mount Kit FP90UM is ordered separately and includes a conduit base, locking ring, and universal adapter for mounting the transmitter on a pipe wall or other stationary surface. Panel mount transmitters fit into a standard 1/4 DIN panel cutout.